When you think about the best ways to get leads and convert them to sales, what comes to mind? Posting ads on Facebook, Google, and/or Instagram maybe? Or sending emails to people on your email list who have purchased products from your store in the past? Perhaps you are more into the old school advertising techniques and think about advertising in newspapers, magazines, or on the radio? What about through web design, UX design, or UI design though? Drawing traffic to your site is important, but if customers don’t enjoy the experience they have once they are there – they will quickly go somewhere else. After all, attracting visitors to your site becomes somewhat meaningless if they go there but quickly leave without buying anything. So as important as advertising is to the overall success of your store, developing an advertising plan that works is not the only step that leads to high sales numbers. Just how important is the design of your store? Let’s start by taking a look at some statistics. Amazon is responsible for more than 49% of all online sales in the U.S. There are a few things to consider about this data. First of all, many Shopify store owners base their Shopify stores in the U.S. in order to have better access to the market, as the North American market and the Asian market account for a huge portion of the world e-commerce market. However, in the U.S. market, the fact that the top 10 companies share such a sizeable portion of the market means that unless you are selling products from your store on Amazon as well, you are competing with thousands of stores for a small piece of what is left of the pie. To make matters even worse, you probably spend way more on generating traffic to your store than you do on converting the traffic that you do get to your store. However, so many people in Asia and North America are using ad blockers that probably very few of the ads that you are paying a lot of money for are actually being seen. What can you do about this? Well, for starters you can optimize the traffic that YOU ARE getting to your store by increasing your conversion rate. Since well over ¾ of business owners are not satisfied with their conversion rates, you and many others are likely wondering how to increase your rate and get more sales. Optimizing traffic is all about design and here’s why! So what do all of these statistics have to do with design?… Everything. How users interact with a site on their laptop VS on a smartphone or app is all determined by the design team. Some sites perform well on laptops, but if they have not been designed well for mobile, chances are the owner will lose sales (just read the statistics above!) UX design is what determines the performance/speed of your site or apps load time, and users expect pages to load in 2 seconds. 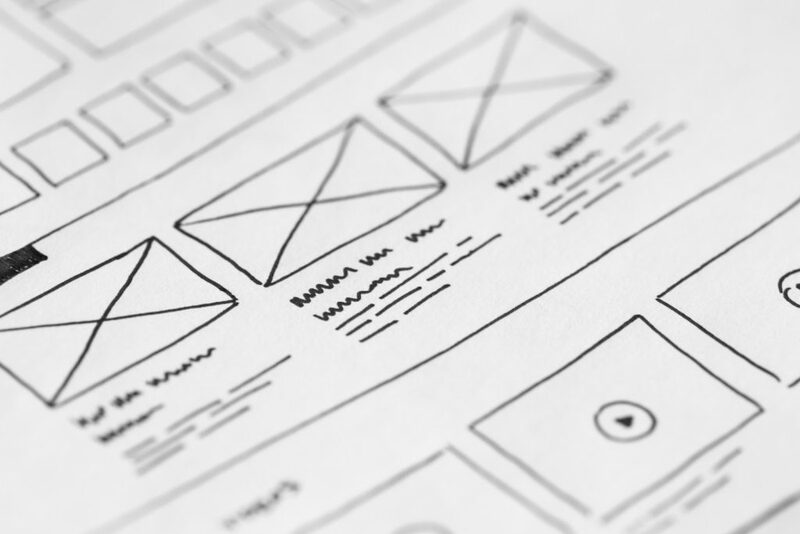 Once your page has loaded, User Interface (UI) design often impacts how long potential customers will stay on the page, impacting the overall likelihood of them making a purchase. Search engines like Google use user engagement metrics to rank websites, so UX/UI design has a very direct influence on SEO. Page speed, mobile friendliness, bounce rate (percentage of users who leave after viewing only one page), and page dwell time (amount of time users spend on a page) are all used to determine where you rank in Google search results. In recent years, a team of UX designers has collected responses from thousands of UX designers around the world to compile a yearly report titled The State of UX. For The State of UX in 2019 the designers working on the project curated and shared 2,239 links with 264,016 designers around the world to isolate what the industry is thinking, writing, and talking about in order to determine what we can expect for UX this year. Changes in feelings towards technology brought on by heightened awareness and the increased presence of data breaches that led to more tech executives testifying at congressional hearings this past year have caused UX design trends to shift from engagement focused to a design that is more mindful of technologies impact on the user’s life. People want products that provide what they need but also respect their time and don’t steal their attention for too long. With this in mind, products should be designed to provide users with a feeling of calm and comfort rather than just to compete for their attention. Following this trend, Shopify store customers will demand their experience in stores to be quick, painless, and easy to navigate, with fewer popups, auto-playing videos, and forms to fill out. A simple design or even a bold design would fit with this trend, but it’s better not to be too flashy. As a Shopify store owner, you have to not only provide the best possible experience for your customers but also keep your store’s design up to date with the latest UX/UI design trends. In the competitive e-commerce market, what you don’t want is for your store to be labeled “outdated” or “irrelevant.” So what’s the point in all of the advertising if once people get to your store it takes too long to load pages, it doesn’t work well with their smartphone, the process from shopping to purchasing stresses them out, it looks like it hasn’t been updated in ages, and it just isn’t cool? Answer: there is no point because your store isn’t a monopoly. You don’t have to worry though, because if you focus more on the design of your store you can prevent these problems from happening, increase your conversion rate, and provide a better shopping experience for your customers! Not sure where to begin? No problem. We have a few tips for you. First of all, make sure the fonts you use for your content fit the brand and products you are trying to sell. However, you should also make sure that the fonts are easy to read. If you write descriptions for your products, make sure the descriptions are short and to the point. People want to know what they are buying, but they didn’t visit your site to read a book, they are there to shop. Too much content in the wrong places on your website can be stressful for customers. Your store should be easy to navigate, and any discounts or loyalty programs should be one of the first things customers see. Make sure the theme and background photos you choose add to the environment you want to create for your customers. And if right now you are still thinking I wish I had studied UX design, UI design, or Web design in college or I wish I knew more about design so I could optimize my store, relax! You could just hire one of Storetasker’s talented design experts to do it for you by requesting a free estimate for your custom Shopify project. John is a Content Writer at Storetasker, where you can outsource Shopify design, development, and marketing projects. You can read more of his work at https://blog.storetasker.com/.